This Airbnb in Hauz Khas has views of the fort and the lake, a green terrace, and is located super close to some great bars and restaurants. Sunset views, amazing location, cleanliness, prompt service. AirBnBs with sunset views, aesthetic rooms, and great locations usually burn a hole in your pocket, but this Hauz Khas gem might be the contradiction we've been looking for. 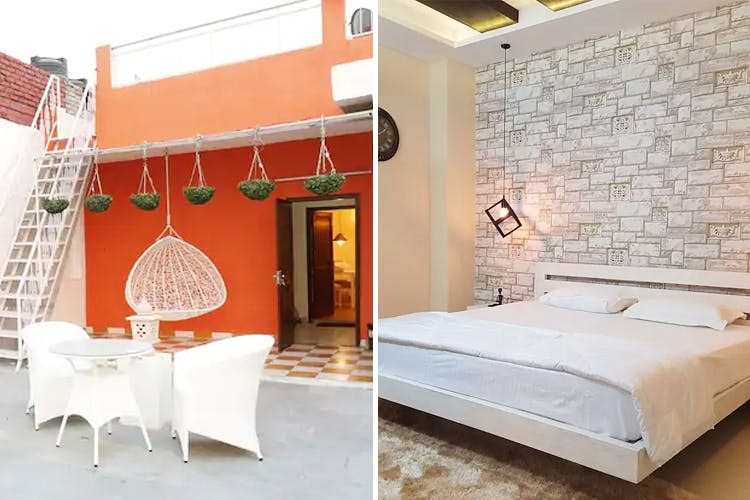 Bathed in a theme of white and green, Village Residency is a studio apartment in Hauz Khas Village that has a spacious, green terrace and a view of the Hauz Khas fort and the lake. It's a one-minute walk from HKV and a five minute auto ride away from Aurobindo Market and SDA–all places where you can get a glimpse of Delhi's nightlife and grab some dinner and drinks. The place is well lit with a lot of natural light, has a double bed, a dining area, and a fully functional kitchen. If it's your first time in Delhi, they even provide a taxi service for sightseeing in and around Delhi (like Agra and Jaipur). We hear the service here is prompt and you'll get all the help you need from the hosts! Head over to Auro or Summerhouse Cafe in Aurobindo Market to catch some great music gigs. Try some amazing shawarma at Spice Aangan in SDA. The rent for one night is INR 3,000.